Where do I start, we booked this hotel after seeing good reviews. What a mistake. The hotel is a bit dated and is in need of a good refurbishment, bare brown carpets on the stairs really put me off. The bedroom was ok but our bathroom need ripping out the shower leaked all over the bathroom and into the bedroom. The so called restaurant was like a work canteen as you walked in the smell was disgusting. The food was awful after you had stud and queued for about 20 minutes. The self service bar was ok we own brand drinks but the down side was that there was an awful smell of stale drink all day and night. You never seen ay staff cleaning threw out the day. There were groups of lads and girls just getting drunk and they were very loud. There was never any staff around to check on anyone it was a free for all. the hotel wasn't clean it was full of french so if you was english you were invisible, the food you couldn't eat so we spent more money just to eat out when we were fully inclusive, the hotel smelled terrible all day and night our hotel room wasn't clean we had same sheets and towels all week. we are glad we had a safe as the cleaners would enter your room when ever they liked some staff were seen coming out of the hotels rooms with wet hair so they were using the showers. the bins were around the food and only emptied when top people came round to check on the hotel the entertaiment was not for childrens eyes. Very good all inclusive hotel , large rooms with balcony ,TV,fridge , nice bathroom including shower /bath and hairdryer.Free bar and snacks 10-30 to 11pm help yourself to all drinks ,beer spirits etc ,Ok its plastic glasses ,but thinking about the safety aspect it would,nt work with normal glasses for safety reasons ,good choice of food to suit all ,mostly French clients but we did,t find it a problem ,plenty activity during day ,archery ,shooting ,bowls plus a fitness center ,nice large pool with water chute ,life guard on duty ,nice shallow kids pool ,evening shows rather poor could be better ,all staff very friendly , one down point is that due to some steps , not suitable for people with mobility problems ,Value for money Hotel !!! This hotel is ok but nothing special as other reviews seem to imply. 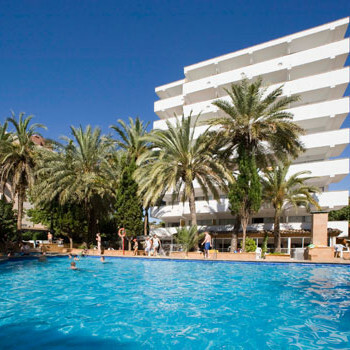 It has a good location with a few bars nearby and is only a 15 mins walk to magaluf but obviously takes a lot longer if you stop at most bars on the way for a drink as we did. The food was again only ok as we were only there for 1 week and in that short time seemed to get a bit repetitive but as I said it was ok. The hotel was clean and tidy and the all inclusive was help yourself which was good as you can make up your own concoctions there is every spirit there (local brands ofcourse)and there is also lager and wine. We have just returned from a two week stay at the Ola Pananama and have had a really great time. Was a bit worried about the hotel, reading the previous reviews, but could not fault it. The rooms had recently been refurbished, were clean and spacious. The food in the restaurant was of a high standard and the self service bar was great! The hotel was mainly French people, but they were very friendly and pleasant. The "Fun Team" worked very hard to keep both children and adults entertained day and night, they were great! We've just spend a week at the Ola Panama on the recomendation of my Sister who went there last year. We all had a fab time - the hotel is very laid back. The sunbeds around the swimming pool are chained together until (either 8 or 9) in the morning so everyone gets a fair deal when getting a sunbed around the pool. The food was very fresh and the Chef did try to cater for the English. There was always something that the Kids enjoyed to eat. The Restaurant staff were very friendly (hello to Juan Carlos. We knew that the rooms had once been self catering and that they still had mini kitchens but this was no problem to us. They were kept very clean by the staff. Being able to try the watersports for 6 euros was a great bonus. We would defo go back next year. The hotel is just set back off the road leading to the beach (approx 2 mins walk.